This prototype was developed in Xiaobo Tan's laboratory. ECE/ISR alumnus Xiaobo Tan, an assistant professor at Michigan State University, recently received a National Science Foundation grant that will integrate his biomimetic robotic fish research with the work of MSU Zoology professor Elena Litchman. Tan is an assistant professor in electrical and computer engineering at Michigan State University. He earned his Ph.D. in electrical engineering in 2002 and was advised by Professor John Baras (ECE/ISR) and Professor P.S. Krishnaprasad (ECE/ISR). 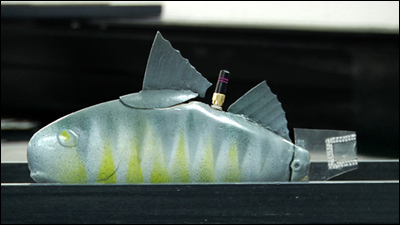 Tan is the PI and Litchman the co-PI on a three-year, $410,000 award for AquaSWARM: Small Wireless Autonomous Robots for Monitoring of Aquatic Environments. The goal of the AquaSWARM project is to design and develop small, energy-efficient, autonomous underwater robots as sensor-rich platforms for dynamic, long-duration monitoring of aquatic environments. A novel concept of gliding robotic fish is investigated, which merges the energy-efficient design of underwater glider with the high maneuverability of robotic fish. Gliding motion, enabled by pitch and buoyancy control, is exploited to realize dive/ascent and large-distance horizontal travel. Soft actuation materials-based flexible tail fins are used to achieve maneuvers with high hydrodynamic efficiency. The research is focused on understanding gliding design for small robotic fish, and addressing the energy efficiency issue from a systems perspective. Schools of such autonomous robots are deployed in lakes at the Michigan State University Kellogg Biological Station to detect harmful algal blooms (HABs) and validate models for HAB dynamics. The project is expected to result in cost-effective, underwater robots that can perform uninterrupted, long-duration (several months), long-travel (hundreds of miles) operation in aquatic environments. This will provide a novel, viable, versatile, cyber-physical infrastructure for aquatic environmental monitoring, with applications ranging from understanding the impact of global warming, to environmental protection, drinking water reservoir safety, and seaport security. The project also offers an interdisciplinary training environment for graduate and undergraduate students, and provides outreach opportunities to inspire pre-college students and train highly qualified teachers. Robotic fish-based HAB detection will also be used as a tool to engage communities at local lakes and stimulate their interest in novel technology and environmental issues. This work will build on previous research Tan accomplished with an NSF CAREER Award and an award from the Office of Naval Research.